My time has come to set sails again. 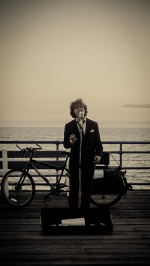 People in Europe and Asia are waiting for me to return on my Voicycle to bring wonderful live-music to their cities. While being in Asia I will stay in Thailand for 3 months and record my original acoustic album. At this point of time I do not know yet when I will be back in Australia. Still, if you have a wedding coming up, send me an email and I will let you know how the chances are for me to return in time. If you travel Europe this summer, make sure to stop by at wonderful La Rochelle (France) sometime between July September. You can then also get my latest CD. Oh, and here is a video from my last street performance in Sydney with the beautiful Opera House in the background. Enjoy! Tuesday, 25th October 2011 - I will be back! After 6 months of cycling 8.500km all over the US west-coast and Europe I will return to Sydney to enjoy the Australian sun and of course entertain you all solo and with "The Full House" on King St (Newtown), at Darling Harbour and Circular Quay. 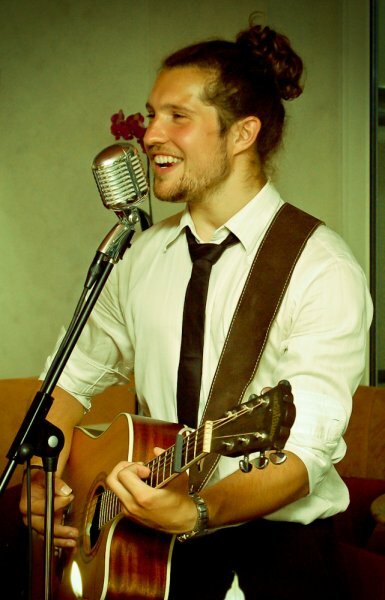 If you have are holding a function - be it a wedding, a backyard party, a corporate event, or any other occasion - between November 2011 and May 2012, I would be more than happy to entertain you and your guests. In the coming six months I will collect more ideas to then finally roll all those moments of the last years into my first original album. I will record it in the beautiful north of Thailand. I am also extremely excited that "Julien Mueller and The Full House" are again chosen to be the main act at next year's "Annual Jazz Festival" at Eryldene Historic House in Gordon on Sunday 11 March 2012 ! 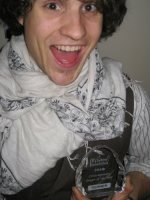 If everything goes well during the flight, if I can settle in quickly and if I can still remeber all those jazz lyrics, "Julien Mueller & The Full House" will have their welcome-back-performance at Darling Harbour on Sun 6 Nov 2011 at 5pm. Bring your friends and family, enjoy the music the sunshine and many bicycle stories. I am looking forward to seeing you all again so soon! Hi everyone! It's time for me to go on a new and exciting journey on a bicycle throughout the US, Canada and Europe. I will leave on March 15th but not without a great last show together with The Full House. We will perform at the on Sunday, Mar 13th from 5pm. The gates will open at 4pm. We are going to make the night shine with 3 hours of finest live vocal jazz and swing live music. All details about this event and booking information can be found here . You can also download the flyer. This night will be great to spend a day with family and friends, have a glass of wine or simply a nice picnic. We'll make sure to have CDs with us and we will also stay around after the show. For those who would like to watch us perform on the street for the last time: Come to Circular Quay on Fri, 11th Mar at around 7.00pm. All details can also be found here. Thanks everyone for your support! We are looking forward to a great event with lots of fun. Sunday, 18th July 2010 - I Made It !!! My heart was racing, all my hopes concentrated on some words, which sound like: "And the Winner is..."
When they finally announced me as the Winner of this year's Sydney Eistedfodd Contemporary Singer of the Year 2010 Competition (NSW) all the efforts and training of the last year seem to pay out all in one second. After the announcement I really wanted to talk to those people who came to the event since they believed in me and wanted to support me by attending the show. But after the first "thank you"s a photographer came up to me to take some pictures of me and some sponsors. Coming back home to my lovely place in the Inner West I finally realized how lucky I was and what a great job I had done over the past weeks. I could hardly fall asleep that night. Everything just felt like heaven! Thank you so much everyone for supporting me in so many ways! Special Thanks also go to Sydney Eistedfodd for supporting young upcoming artists! 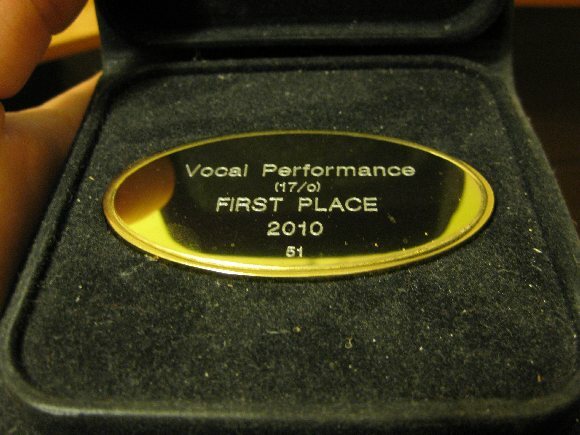 Monday, 5th July 2010 - I made it to the Finals! I made it, I made it!I will have about 2 weeks time from now to prepare myself and pick three amazing songs. Can't wait for the big show! 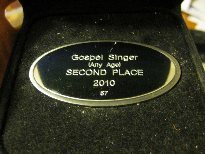 My passion for Gospel singing made me want to try the 'Gospel' Category of this year's Sydney Eistedfodd - Contemporary Singer of The Year Competition 2010. This time I brought my guitar and Jeremy Camp's 'Who Am I' . I almost missed my performance due to bad restroom timing (I always warm up before the performance and come out to the stage when I was announced)! Fortunately my name was called out twice and so I made it just in time! When coming up the stairs of the stage I almost fell with my guitar. What a great start of a performance! The most important part of the performance went pretty well though. Enthusiastic and inspiring adjudicator Francince Bell later on announced the results for this Category. Last year's Contemporary Singer of The Year Amy Walton came first. I was runner up and happy to go home with a silver medal. 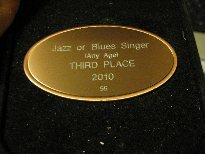 Just one day after my success in the Contemporary Singing Category I tried my best in the 'Jazz or Blues Singer' Category of this year's Sydney Eistedfodd - Contemporary Singer of The Year Competition 2010. I brought a backing track to sing to and an apple to calm me down before the performance. With the song 'Me and Ms Jones' which has become widely popular by Canadian Jazz singer Michael Bublé I earned myself the 3rd place. Well, it was not really was I was aiming for (of course I was aiming for no.1 haha) but I was still satisfied to be awarded with a medal. Thanks everyone who came down to watch and support me! 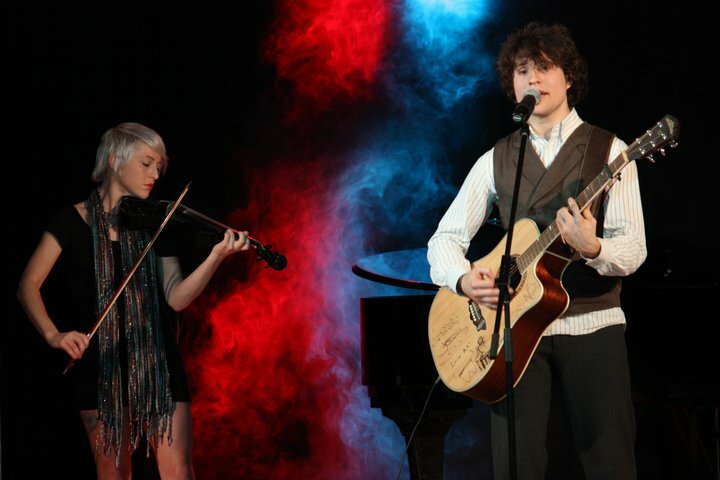 If you have a second check out amazing Liam Burrows who ranked 2nd and is extremly talented for his age of only 16 years! 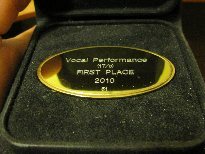 Monday, 21st June 2010 - Placed 1st in the category 'Contemporary Singing'! I just came home from a singing competition held at the Petersham RSL club. 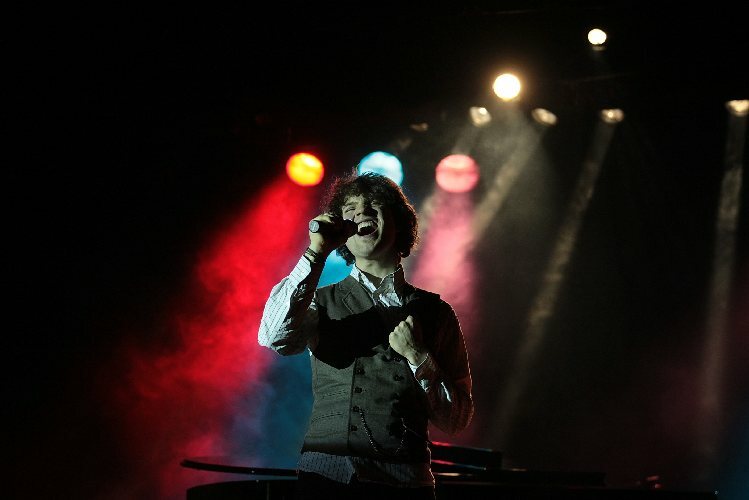 I was performing among Sydney's top vocalists in the category 'contemporary singing' of this year's Sydney Eistedfodd - Contemporary Singer of The Year Competition 2010. 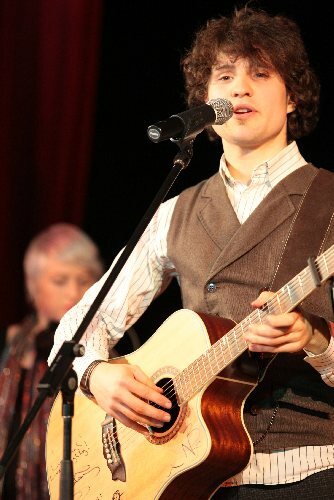 To this competition I brought my guitar, my voice and a lot of excitement. I was the 10th person to perform among 60 other contestant and sang 'Plane' by Jason Mraz. After everyone had their go, the judges took a few minutes to choose the winner. I couldn't wait for the results! A few minutes later I was relieved and incredibly happy to be announced WINNER of this category with a very satisfiyng score of 98 out of 100 points! This will also enroll me for the semi-finals of the main category of this competition! Also I would like to congratulate my friend Miranda Hayman who came 2nd! Good job! Thank you everyone for cheering for me and for supporting me today. What a joyfull week that was! 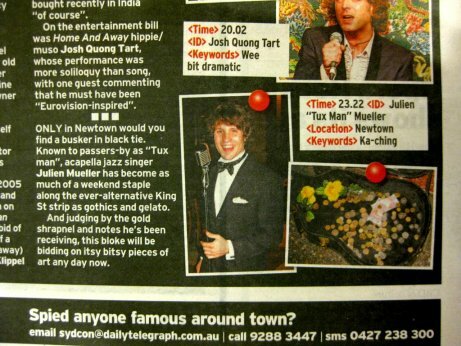 Julien the TuxGuy made it into the Daily Telegraph with a photo. Thank you Joel Christie for keeping the eyes open on a Saturday night, taking photos and then writing the article. 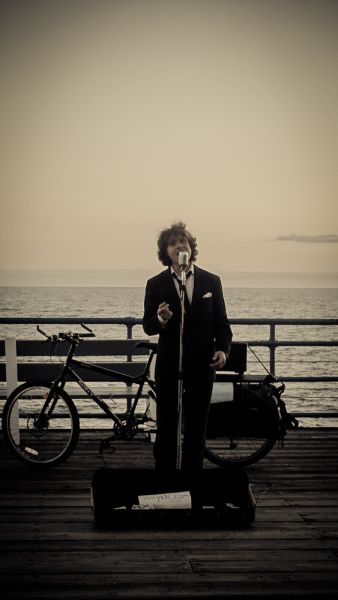 We hope everyone interested in watching Julien perform found him by searching for "Tux Man". On Friday Julien performed with his new Jazz Band (Jazz Guitar, Bass) in Newtown and had a blast! The songs are working better and better and very soon you might end up seeing Julien with a whole Big Band busking at Circular Quay. Julien would like to thank everyone for supporting him and his band in Newtown on Friday and Saturday night. With your support he can live his dream. And for him, that is worth lot! Next show will be Fri 11th June with the Band playing in Newtown in front of the DENDY Cinema at around 7pm. Today Julien performed with his new Jazz Band on King St a second time. The guitarist (Francisco Ferreiro) and the bass player (Marcos Gil) are amazing. Next performance dates will be announced shortly. Julien says thanks to Laisa and Daniel for having him at a private party in Earlwood. 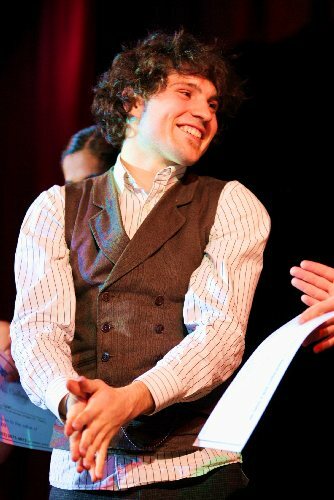 He would also like to thank everyone else who was busy dancing, taking photos and enjoying the show. More content will be added to the TuxGuy website shortly. The new website is almost finished. You will find all completed information and some songs shortly. If you like to see Julien perform tonight come to Favela in Kings Cross.